It is getting close to Father’s Day and, yes, I am thinking about mi padre. My dad is not your typical guy. No, no, no. In order to prepare my sisters and me to start going out on dates, he wanted to teach us how to hold our liquor. Let no man ever get us drunk! He taught us how to play Backgammon. And cards. And Dominoes and Blackjack and Rummikub and Crazy Dice. He taught me how a single taco, made with a fresh corn tortilla and a sprinkle of the right amount of salt, can be the best meal of your life. But, maybe most importantly of all, he taught me to get up no matter how many times life whirls you around and throws you down. 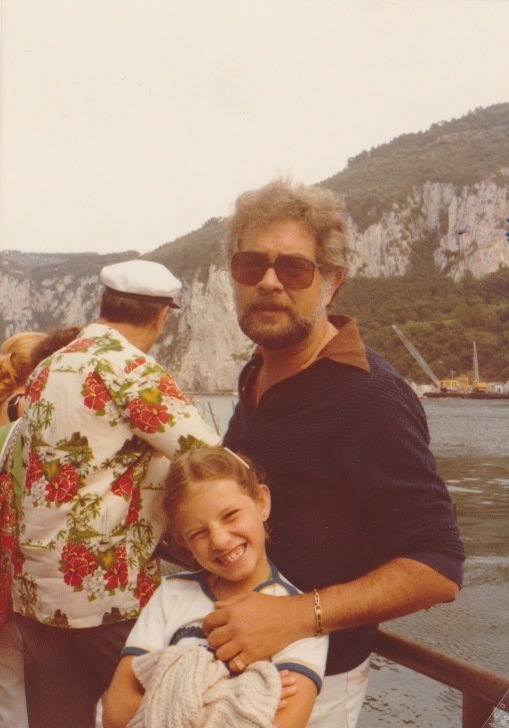 On a family vacation, when I was 8 or 9, with my dad. A few years ago, he came to visit and stayed with my boys, while my husband and I went on a trip. After three nights away, I came back to find boys who knew how to play Backgammon, cards, Dominoes, Blackjack, Rummikub and Crazy Dice. And, also, boys who started swearing in Spanish at bad drivers (which I reversed right back!). He knew better than to teach them how to hold their liquor…He knows that, just like him, I am an Aries who can show my temper. Or maybe he just didn’t have enough time. I know my dad would love to have these Tequileras on the Backgammon table. Or as he plays cards, Dominoes, Blackjack, Rummikub or Crazy Dice. 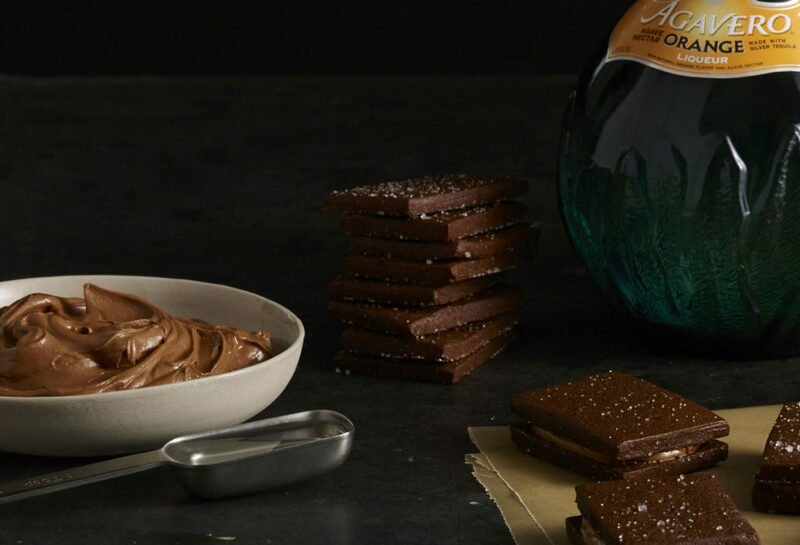 These Tequileras, as I baptized them, are a grown up sandwich cookie with deep chocolate flavored biscuits that aren’t too sweet, and the gentle bitterness of the cocoa comes through the slightest bit. 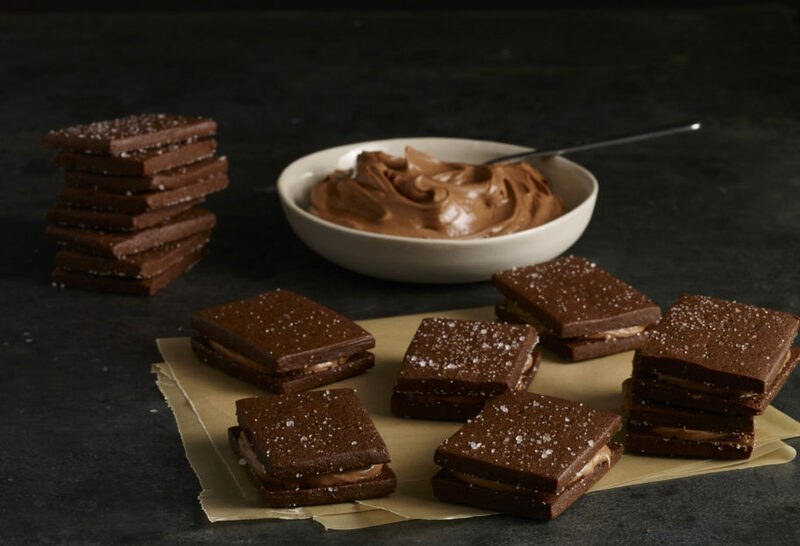 Between the two crunchy, chocolatey biscuits is a rich, sweet buttercream made sophisticated by a dash of orange tequila liquor. These cookies are sweet, complex, and full of life…kind of like the guy I had in mind when I was creating them. One of hundreds of weekends I spent with my dad in Valle de Bravo, getting some serious Backgammon training! This one is for you, Pa, I know you read all my blog posts by now. To make the cookies: In the bowl of a mixer, beat the butter with the brown sugar and ¼ cup of the granulated sugar at medium speed until soft. Add the vanilla and the egg, reduce the speed, and incorporate the cocoa powder. Scrape the sides of the bowl if need be, add the salt and the flour, and continue beating until it is all thoroughly combined. The dough should be soft and a bit cakey. Gather into a ball, wrap in plastic and place in the fridge anywhere from 20 to 30 minutes. Preheat oven to 350 degrees. Line 2 baking sheets with parchment paper and set the oven racks in the upper and lower thirds of the oven. Flour the countertop and a rolling pin generously. Roll out the dough into a rectangle of about 1/8” thick. Cut into rectangles of about 2” by 1½”. With the help of a metal spatula, place on the baking sheets. With the tip of a pencil or a toothpick, mark a “T” with 3 to 4 dots going up and then 1 to 2 on each side of the top of the line to mark a T. Sprinkle with the remaining 2 tablespoons of granulated sugar. You can reuse any scraps of dough and roll out again. Bake anywhere from 7 to 8 minutes, until firm. Remove from the oven and let cool. To make the filling: Place the chocolate in bowl in a double boiler over simmering water until it melts. In the bowl of a mixer set with the paddle attachment, beat the butter until creamy. Incorporate the confecioners’ sugar and beat until completely mixed. Add the melted chocolate and the Agavero and continue beating until completely mixed and very creamy. To assemble: Turn half the cookies upside down so sugar coating is on the bottom, cover with a dollop of filling, and top with half of cookies upside down. Store covered at room temperature. Oh I’m so lucky! I hope you and your mom love the cookies, Rayna. Would orange juice or orange syrup work instead of the liqueur? Sure! Or you can just skip the liqueur all together. They will still be delicious…I always leave a few without the liquor for those who don’t want it. Love your show! Decided to make Tequileras this weekend. They look awesome! Also, you gave me some good ideas by talking about how your dad teaches. We take care of my nephew’s 7 year old son sometimes. I taught him how to play poker, but I need to teach him to play backgammon and crazy dice. I think he’s a year or two away from learning how to hold his liquor! Just saw a commercial on Channel 21PBS that they’ll be having a Patti’s Mexican Table marathon; so excited about watching all the episodes, love her show and since I love Mexican food, I really appreciate her recipes for real, authentic and delicious food. What brands of cocoa powder and bittersweet chocolate should we look out for? So many traditional Mexican recipes use chocolate, but local Latino markets only seem to carry the hot chocolate drink mixes (with the disgusting ingredient list :-(). Whatever you find at an American grocery store works! This is the very first time I have ever posted anything on someone’s blog-but I had to tell you, watching your show brings back so many memories of my mom and dads cooking. And the beautiful places you visit, oh my, it makes me want to visit each one! What I love about your dishes, is that they are so authentic! The traditional ones are so much like my parents cooking! Sweet memories! It’s been many years since I last visited Mexico, watching your show makes me long for a visit. I’m sorry I missed going to see you when you were recently in Las Vegas! I wish you continued success! Oh my goodness… this is so touching! Thank you so much for your kind words. I am glad you like my recipes, and I am even happier that my show reminds you of your family. All my best to you! Is there a Roku channel where we can watch your show? I am currently just on Create TV and public television! great cookie , made 2 batches, second one small squares to serve as tea cakes, big hit at afternoon book club!!!!! Pati!! Gracias for the Photos!! Of course you are adorable & I remember first seeing your Cool Padre on an episode of your show. WoW! He was hot & handsome with his beard & cool sunglasses. I’m going to t r yyyyyyy to make these, they are so beautiful!! Thank You again, Pati?? Loved reading some of the things your father taught you, Pati. And this dessert looks so delicious and perfect for us chocaholics! Nice pictures…. you were cute even as a little girl……:)…..
What a nice tribute to her Dad! And the cookies look yummy! Hi Pati! Never expected you to reply! I’ve watched you on Public Television for a long time, but I’m new to your blog. I love it! these look soooo good.. I’m gonna have to substitute Gran Marnier for the Agavero Orange Liqueur as I’ve never seen this in Canada…won’t be quite the same without the tequila back flavour.. maybe just add a teaspoon of tequila or split 1 tablespoon of each? You can just substitute for the Grand Marnier, they will be great as well!